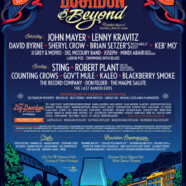 The second annual Bourbon & Beyond festival makes its much-anticipated return to Champions Park in Louisville, KY, Saturday, September 22and Sunday, September 23 with the perfect blend of bourbon, food & music not found anywhere else in the world. Festival producers Danny Wimmer Presents, culinary curator Edward Lee (The Mind of A Chef) and bourbon curator Fred Minnick have put together another incredible bourbon, music, and culinary lineup for the weekend. World-renowned musicians including Sting and Robert Plant And The Sensational Space Shifters, as well as superstars John Mayer, Lenny Kravitz, Counting Crows and David Byrne, lead the music lineup of more than 30 artists. Tom Colicchio, Stephanie Izard, Aarón Sánchez and Ray Garcia lead the culinary lineup of more than 20 chefs. The festival’s centerpiece, the Big Bourbon Bar presented by Louisville Courier Journal, will feature more than two dozen bourbons selected by best-selling author and renowned bourbon authority Fred Minnick, Bourbon & Beyond’s official bourbon curator. Acclaimed Louisville whiskey barThe Silver Dollar will operate The Hunter’s Club, where attendees can find vintage bourbons dating as far back as the 1930s, as well as contemporary collectibles — which last year included more than 50 rarities. The festival also announces the return of Fred Minnick’s Mini Bar presented by The Bourbon Women Association, which will showcase this year’s craft bourbon selections: Hartfield & Co., MB Roland, Old Pogue,Wadelyn Ranch and Wilderness Trail. Bourbon & Beyond exclusive VIP packages, General Admission tickets, camping and hotel packages, as well as special event tickets go on saleFriday, April 20 at 12:00 PM EDT. Visit www.BourbonandBeyond.com for more details. The current music lineup includes: Sting, John Mayer, Robert Plant And The Sensational Space Shifters, Lenny Kravitz, Counting Crows, David Byrne, Sheryl Crow, Brian Setzer’s Rockabilly Riot!, Kaleo, Gov’t Mule, Keb’ Mo’, Blackberry Smoke, JJ Grey & Mofro, Don Felder, The Record Company, Del McCoury Band, Joseph, Magpie Salute, Mindi Abair And The Boneshakers, Larkin Poe, The Last Bandoleros andSwimming With Bears. Bourbon & Beyond also offers a unique series of over 30 bourbon and food-focused seminars at the festival, including a first-ever discussion betweenJack Daniel’s master distiller Jeff Arnett and Jim Beam’s master distiller Fred Noe. Bourbon & Beyond again welcomes The Daily Beast as the festival’s official media partner. Noah Rothbaum, the editor of the Daily Beast’s“Half Full” section and co-host of its podcast Life Behind Bars, will be onsite at the festival capturing exclusive content throughout the weekend.